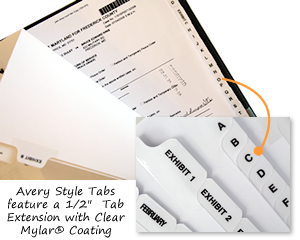 Manage each exhibit's details in files and folders with our Avery style collated numeric exhibit tabs. • 2 banks of 10 tabs are offered here. First bank has 1-10 numbered tabs and second bank has 11-20 numbered tabs.